What are some characteristics of lipomas? Though a lipoma is a type of tumor, it is completely unrelated to cancer and will not become malignant. Lipomas are composed of excess fat cells, which cluster between the skin surface and deeper muscle tissue. The cause of lipomas is unknown, though they sometimes grow as a response to minor injury. The tendency to develop lipomas is likely genetic. They can appear in almost any body area, though they are most common on the neck, torso, armpits, upper arms, and upper thighs. The procedure to remove lipomas is quick and easy. Your doctor injects a local anesthetic to the area, makes an incision, removes the lipoma, and stitches up the incision. If the lipoma is not easily accessible through an incision, it may require removal in an operating room using general anesthesia. What are the costs and insurance coverage for removing a lipoma? Most lipomas do not have to be removed since they are painless and usually don’t cause problems. Patients may wish to have them removed for aesthetic reasons. 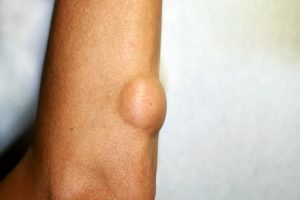 Occasionally, a lipoma might become painful, get infected, or be located in an inconvenient spot that inhibits movement. Your health insurance will usually cover the excision of the lipoma. However, without insurance, the cost of removing a lipoma can range from $1000-$3000, depending on the size of the growth, its location on the body, and other factors. Larger lipomas tend to cost more. Insurance coverage will vary depending on the reasons for excising the lipoma. Insurance will generally decline to pay for cosmetic procedures, though if removing the lipoma is a medical necessity (to alleviate pain or prevent infection), insurance should help cover the costs. We at Beverly Hills Plastic Surgery Group are committed to guiding you through this process.